"Aquatica Plus UK ships Stephanie Alexander’s Kitchen Garden Companion: Dig, Plant, Water, Grow, Harvest, Chop, Cook from Amazon.co.uk. Amazon.co.uk has fast shipping in the UK and often free shipping on pond and aquarium supplies. Add to your basket now while supplies last to avoid delays." 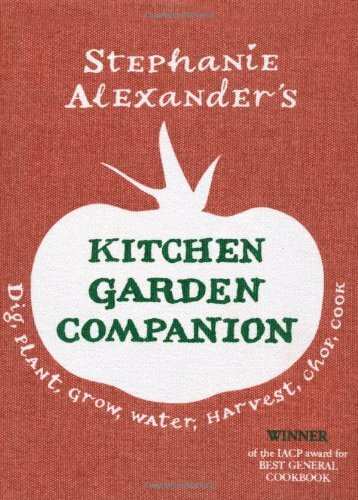 What customers say about Stephanie Alexander’s Kitchen Garden Companion: Dig, Plant, Water, Grow, Harvest, Chop, Cook? My husband and I are sharing this book – he is a keen gardener and I am a keen cook so it is an ideal book for both of us. Although the gardening advice means little to me, I love the recipes in the book. There are so many recipes that this would be a vauluable guide to cooking produce in season even if you had no garden at all. I was particulary impressed with the range of simple but effctive dishes included – not many of us have hours to spare for cooking everyday meals – and the delicious twists on traditional dishes from all over the world. Stephanie Alexander is not someone I have been aware of before now, though she is evidently well known in Australia, where she made a name for herself through her scheme to establish kitchen gardens in primary schools, inculcating in children from an early age the love of gardening and respect for Nature. This is a principle that I too feel strongly about, so she gets me On-Side immediately. Because of her previous work with schoolchildren, Stephanie is particularly keen to play-up the opportunities to get children involved in both the gardening and the cooking aspects, and her book is liberally interspersed with Especially for Kids sections. Stephanie’s book has lots to offer for the beginner, but it also has a wealth of useful advice for the experienced reader too. As a gardener of 25 years or more, I can see that the information provided in the book it sensible, practical and “tested”. My wife Jane has a similar length of experience in the cookery field and is a very accomplished amateur cook. She confirms my view that the culinary content of the book is similarly excellent. One point she particularly noticed is that the vegetable element of the recipes remains the star attraction – the recipes mostly use “store-cupboard” ingredients, without asking you to buy loads of fancy extra bits and pieces to pretty them up. As the previous reviewer says, this is a massive tome of a book, set to give your biceps a good workout in preparation for the double-digging etc., although this is very specifically not required for her style of gardening! The fabric jacket echoes the excellent production, with two comprehensive indices making it easy to find either recipes (by name and by type) or plant. The photographs illustrate both the plants and the dishes and are beautiful in their texture as well as being an aid to identification. It starts with a very good guide to her style, which majors on container and raised bed gardening, giving ideas for recycling wooden containers such as apple crates and wine barrels to hold herbs and vegetables. Each chapter in the A to Z list, which contains some more unusual ingredients such as aramanth and scented geraniums, starts with a list of basic “how tos” including soil type and preparation, how to grow, harvesting and, interestingly, companion planting. This is then expanded over a couple of pages to include a section on children’s involvement, before the recipes start. She has launched a major initiative in Australian schools on involving children by setting up kitchen gardens in the schools (something my own school did in the UK from the 1st World War onward!) and designing recipes to be child friendly, both in the cooking and the eating – it really does go from Dig, Plant, Water, Grow, Harvest, Chop, to Cook! There is also a very good glossary. The recipes are straightforward but interesting, including broccoli with home made orecchiette, interesting spice mixes for lamb shanks, pickles, variations on master recipes, e.g. for fennel, things to do with fresh olives (if our tree would ever produce) and include main dishes, side dishes and desserts. The methodology is clearly laid out (as in “The Cook’s Companion”) and some recipes include stage by stage photographs. I loved this book but I do have one problem with it – do I keep it on the gardening shelves or the cookery ones? Perhaps I’ll just have it in the kitchen for when the garden gives inspiration! If you’re looking for a comprehensive guide to growing fruit and vegetables, plus lots of recipes to deal with all of your produce, then you need look no further than Stephanie Alexander’s Kitchen Garden Companion. Stephanie hails from Australia, where she is a very popular cookery writer. In addition she’s pioneered getting children involved in both growing and eating food, resulting in her founding the Kitchen Garden Foundation, which has projects throughout Australia. It means the book is slanted towards getting children involved, but the book is useful to all irrespective of age. It’s also a hefty tome, with over 700 pages featuring over 50 fruit and vegetables. The first part of the book is geared towards making sure the reader is adequately equipped for both garden and kitchen; plus there’s a general introduction to getting started in the garden and gardening with kids. The bulk of the book deals with each crop in alphabetical order: from Amaranth through to Zucchini. For each crop there is a page of general information about growing, followed by a couple of pages going into a bit more depth about growing and harvesting, plus sections on container gardening, preparation for the kitchen and a final section called Especially for Kids, but which has a wealth of unusual facts which I hadn’t seen before, so it was interesting to me too (or perhaps I’m a big kid at heart?). The gardening section is then followed by a number of recipes: sweet and/or savoury as applicable. The recipes reminded me very much of eating out in Australia: they draw on the wealth of culinary influences from the many immigrant communities there including Italy and Greece through to Asian fusion food, so there is plenty of inspiration to suit all tastes. Stephanie is also very good at suggesting substitute ingredients, thus extending the possibilities even further. I’ve tried quite a few recipes already and have particularly enjoyed the Pumpkin, Coconut and Seafood Soup, Easy Plum Cake, Oven Roasted Pears and Dried Borlotti Beans with Pork. I like being able to see what I have a glut of in my kitchen and immediately have several possibilities to hand in one chapter, rather than having to hunt through an entire book or the index to see what tempts me. The book ends with a Basics section which includes garden and kitchen glossaries, plus a chapter on pests and weed control with the emphasis on organic methods of control. I must confess I found the separate glossaries a little frustrating as almost invariably I’d open the Kitchen Glossary to look up a gardening term and vice versa. Whilst this book originated from down under, it’s clear that it has been extensively re-edited for the UK market, which the publisher also confirmed when I contacted them. The exception to this is the naming of some vegetables: thus chard is found under silver beet and courgettes under zucchini. However, to have renamed these to their UK counterparts would have resulted in an re-indexing nightmare, so I can understand why they were left alone. The book comes with a protective cloth cover, plus two silk bookmarks, which are nice touches and I found the latter particularly useful when following the recipes. It’s almost impossible with such a large book to keep it open at the right page when using recipes from the front or end sections. Personally I found the recipes of more value than the gardening, hence my giving the book an overall 4 out of 5 stars. I have plenty of grow your own books already and still prefer to consult these. However, I’m sure that someone starting growing fruit and vegetables for the first time will find the cultivation sections just as useful as the cookery ones and would probably give 5 stars just like many of the other reviewers have done already.